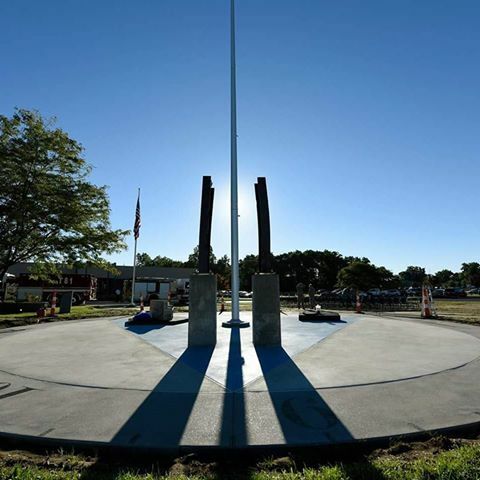 Several hundred military men and women witnessed the unveiling of the Northwest Ohio 9/11 Memorial at the Air National Guard’s 180th Fighter Wing base. The Ceremony, held on 9/11, commemorated the 15th anniversary of the Sept.11 terrorist attacks. The memorial is currently under construction, but the first phase of the project is complete. Members of the 180FW worked diligently to collect various artifacts for the memorial, including steel beams from the World Trade Center, limestone from the pentagon and soil from Pennsylvania where Flight 93 crashed. The memorial, designed as a sun dial, will also include locally, hand-blown glass pieces representing the 2,977 lives lost in the attacks. TRACE - Toledo Regional Architects, Contractors & Engineers, along with support from other Toledo community partners are working together to engineer and construct their vision and plan to complete the permanent memorial by Sept. 11, 2017, the 16th anniversary of the attacks.